Researching in the local newspapers before and during the second World War we can see how the war affected village life. Some mention has already been made in the school history pages and also a page has been given to the children who came to the village as evacuees. Details of the Village war memorial to be found in the churchyard and also the rolls of honour in the church, can be found elsewhere on this history site. As early as 1938 preparations were being made in the village for the onset of another World War. The Ripon Gazette dated 7th April 1938 tells us that a Air Raid Precautions [ARP] committee was formed at a meeting which was well attended in the village schoolroom. The West Riding Anti- Gas Officer gave an interesting address on Gas and how to combat it. Mr H. Bottomley also addressed the meeting and appealed for helpers. 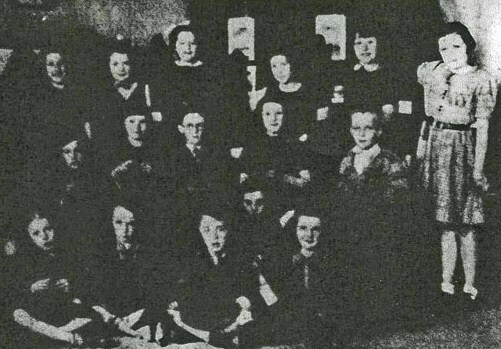 The next meeting was held, again in the schoolroom, and reported in the paper dated 21st April 1938. Mr W. L. Trenholme was elected Chairman and Mr F. Leathley Clerk & Storekeeper. Mr Sykes the visiting ARP officer gave a talk on Air Raid precautions and he answered questions. He informed the meeting that volunteers for First Aid work etc would receive instructions at the Kirkby Malzeard centre as it was impossible to secure lecturers for individual villages. Free transport would be provided. A vote of thanks given to Mr. Sykes by Mr. Trenholme. Before the outbreak of war the Air Ministry had forecast that Britain would be exposed to sudden air attacks that would cause high civilian casualties and mass destruction from enemy night bombers. A lecture on air raids was given in Kirkby Malzeard village hall by Mr. Grosvenor of the Air Ministry. The Chair was taken by Mr F. D. Moore. ARP wardens and 1st Aiders from Galphay, Grewelthorpe. Laverton and Kirkby Malzeard were present. He dealt at length about the method of attack by aircraft including high explosives, incendiary and gas attacks. He said civilians best weapons against air attacks were intelligent foresight and preparedness and full confidence in forms of protection. Clearly it was common sense duty of every householder or head of family or business to learn how to protect in case of air raids. To counter this threat it was widely agreed that if man-made lights on the ground could be put out then the enemy would find it difficult to navigate and pinpoint their targets. It was believed that if Blackout controls were introduced, it would make the enemy bombers job more difficult. 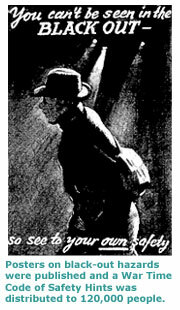 Indeed as early as July 1939, Public Information Leaflet No 2 (issued as part of the Air Raid Patrol (A.R.P.) training literature) warned civilians that everybody would need to play their part and ensure that the Blackout regulations were properly enforced during the Blackout periods. On the 1st September 1939, two days before the outbreak of war, Britain was blacked out. The Blackout imposed on all civilians was absolute. No chinks of light, no see through curtains, no car headlights. Even the red glow of a cigarette was banned. Britain was plunged into complete darkness. It was reported in the press in April 1940 that Mr Thomas Bain a motorist from Grewelthorpe had been fined 10s [50p] for failing to screen off the headlight of his car. A powerful light was seen to be shining from the offside headlight & the diffusing screen had been removed. The accused said he had taken it off because of the fog and had forgotten to replace it. Typical poster about The Blackout. The local women were not to be left out. They organised themselves into groups preparing items for the soldiers at the front and also as a support for local Red Cross units. In February 1940 the Ripon Gazette reported that the Kirkby Malzeard Working Party had sent, since Oct. 1939, to the Red Cross Depot in Ripon the following items. 52 towels. 40 abdominal bandages. 20 chest bandages. 10 pairs of bed socks. 10 pairs of operation stockings. The previous week Lady Moore, Mrs Horton & Mrs Baker had given knitted comforts to soldiers stationed at Kirkby Malzeard and to local boys with the forces. These included 35 helmets. 27 scarves. 36 pairs of gloves & mittens. 17 pairs of socks and 1 cardigan. Donations of £12.5s and the proceeds from socials and whist drives amounting to £24.5s.7d were also sent. Groups of knitters from Galphay in 1940 knitting comforts for the forces. As the war progressed a huge amount of fund raising was undertaken by the villages in the Ripon district. Social events were organised weekly, whist drives, knitting circles, dances, concerts, house to house collections etc. All were reported in the Ripon Gazette each week. January 1941. Dallowgill had a house to house collection organised by Mr. A. Frankland & Mr. W. Trenholme They collected £7.12s.6d. A similar collection was made in Laverton by Mr. F. Ellis. A social was held in the village and another £3.8s.6d was raised making a total of £11.1s.0d. for this small community. February 1941. 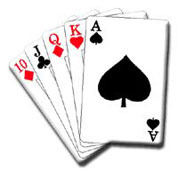 A Whist Drive in Grewelthorpe raised £2.12s.6d for the Sailors & Airmen Families Association. In 1941 many children were evacuated to Grewelthorpe from the South of England. 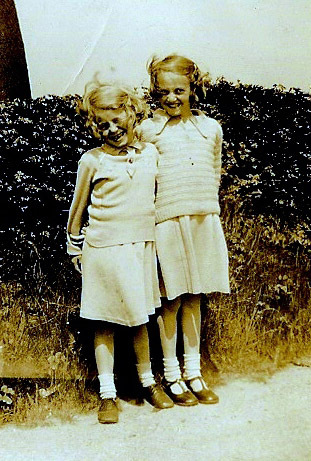 This is the story of 2 of those children, Barbara & Lilian Johnson. written by Barbara. [see also the page on evacuees in the history section]. I WAS AN EVACUEE. by Barbara Wood [nee Johnson]. On September 3rd 1939 war was declared. I was five years old and have no recall of that day. My first memory of the war was in 1940. Mother had a Brother who lived in Detroit U S A and it was planned that my sister and I would be sent there for the duration of the war. In preparation for this my sister and I were taken to the school clinic for medical examinations. I remember sitting in the dentists chair and then with some shock being aware of sitting on Mum’,s lap with my head over a basin and being told to spit out the blood in my mouth. I became aware that six of my teeth had been extracted- all healthy teeth! As our departure date drew near Mum and Dad had a change of heart and decided against sending us to America. They did, however, arrange for our being evacuated with others from our school to Yorkshire. In March 1941 accompanied by a teacher from our school we left Brighton station with labels on our coats and clutching luggage and a packed lunch prepared by Mum. My most vivid memory of the journey is of sharing the contents of our lunch boxes with our companions. I remember Lily and I had raw carrots among our goodies and these proved very popular and we made some good swaps. We travelled by train to Ripon and then by coach to our host village of Grewelthorpe. We arrived at the school and one of the teachers took Lily and I by the hand and walked us to our new home where we were welcomed in by Aunty May and Uncle Albert. I remember our first outing with Aunty May which was to the village church graveyard to visit her daughter Jean’s grave she had died at the age of ten months. I have very strong memories of feeling incredibly homesick but do not remember crying. Lily, who is nineteen months older than I, was also missing Mum and Dad. I was a nervous and shy child and had developed a dependency on my big sister who was more confident and outgoing. A very strong bond developed between us as we struggled to cope with our loss and the challenges ahead. It was years later that I learned that siblings were often separated- how lucky we were to be together. I know I would not have coped without my sister at my side-cuddling each other at night and my reluctance to let her out of my sight. However, we were so lucky to have been placed with Aunty May and Uncle Albert who gave us a safe and secure home, helping us to adjust to our new life. Aunty May coping so well with tolerance and understanding at my bed wetting, even on the occasion when Lily and I woke to find I had wet the bed once more and thought we could dry it by placing a library book between the sheets to allow air in. Our horror in the morning to find the sheets stained red. Grewelthorpe was a small village. really just one street, our house was beside the pond and the back gate opened into a field where cows were grazed. On one occasion we opened the gate to find a bull in the field and refused to move through much to Aunty May’,s admonishments and amusement. The school had just two classrooms- one for under sevens which I was in- and the other for seven to elevens which Lily was in. During the lunch break selected children were lined up and each in turn given a teaspoon of cod liver oil. Lily escaped this but I being of slight build was not so lucky. A memory of tuition was being told to pronounce the letter u as oo. i.e. to say oop not up. On Sundays we attended church where Lily and I enjoyed being allowed to pump the organ. For Harvest festival we helped Aunty May shell a considerable amount of Honesty which we took to the church where Aunty May decorated the pillars. I was so disappointed two days later at the service when I saw floral additions had hidden the honesty. Uncle Albert’s parents had a farm at the other end of the village and we would often visit. On one occasion Uncle Albert was helping his father ring the pigs snouts. They were in a barn and the pig was roped and the rope brought over the door and Lily and I were told to hold the rope tight and on no account to let go. Good fun we thought until the pig squealed when we both let go of the rope and ran away. Uncle Albert was not pleased. Hay making was a really fun time. Aunty May would drive the tractor and the hay was forked up on to a trailer and great excitement if we were allowed to sit on top for the ride back to the barn. We also enjoyed sliding down the hay chute until we got splinters in our bottoms. Aunty May’s Mum lived beside a railway and we enjoyed going there. Mrs Crossley was lovely and would welcome us on her lap for a cuddle. It was always a delight to be with her. Lily and I liked to visit the signal box where the signalman always had something interesting to tell us. He at our request, would play a record of men’s conversation who would swear and as it continued the swearing increased when he would stop the record. Aunty May was very disapproving and forbade him to play it. At the end of the village. opposite the farm was the entrance to a wood-Hackfall. Lily and I would explore and spend much time there. Uncle Albert would go there to catch rabbits, netting them with the help of ferrets. He sometimes went in the early morning to shoot the rabbits which his dog Brenda retrieved. We were not allowed to go on these morning visits. Brenda was a working dog and lived in a kennel in the backyard, so was not a family pet. We did have pet rabbits and after school, Lily and I would wander the fields and lanes to pick their food- Aunty May making sure we did this everyday. At the end of July we learnt that Mum and Dad were coming to stay for a week. On the day of their arrival Lily and I sat in the front garden shelling peas, eagerly awaiting their arrival. At last a taxi pulled up and out stepped Mum and Dad. Although there was no display of hugs and kisses, it was so good to have them with us. The four of us shared the double bed in our room- the house having just two bedrooms. All too soon the week passed and Mum and Dad returned to Brighton. Every week since our evacuation in March mum had sent us a parcel. always exciting to receive and open. On August 22nd, my seventh birthday an extra large parcel contained a black doll for me. It was about this time that I became unwell and was seen by a doctor. Nobody seemed to know what was wrong with me, though I now wonder if there was a diagnosis of home sickness. September came and one of our weekly parcels was small and wedged shaped. Lily and I wondered why Mum had sent us cheese. However, on opening it was not cheese but I believe was sweets. Also there was a letter for Aunty May to say Mum and Dad wanted us home and that they would be collecting us. Aunty May was very upset and Lily cried too. For me I felt a great sense of relief, at last going back to Mum and Dad. The day for Mum to arrive came and we waited patiently. Our bed time came and Lily and I went to sleep to be woken later by a disturbance in our room. Aunty May and Aunty Hilda from Brighton were feverishly packing Lily and my belongings. We learnt that Mum felt unable to face the journey and taking us away from Aunty May. Aunty May, in turn, could not face a protracted goodbye and requested that we leave the next morning. Aunty Hilda finally after her long day got into bed with us at midnight. Very early the next morning Aunty May walked with us one mile across the fields to the next village where we caught the 7am bus, and we said our sad goodbyes. We arrived back in Brighton mid afternoon and I raced through the house eager to run into mums arms. Out into the garden where she was sitting on the wall. Hello Mum and she burst into tears, a momentary panic, perhaps she didn’t want us home after all! The emotions passed and the family was reunited and at peace with happiness at being together again. To Mums relief we in time lost our Yorkshire accents. June 1941. Whist Drive in Grewelthorpe organised by the knitting circle to raise funds for distressed areas. At Christmas 1943 A Christmas gift of £1 was sent to each of the Grewelthorpe men and women [about 49] who are serving with HM Forces. March 1944. Mr & Mrs. W. Harrison of Oak House Grewelthorpe held a whist drive in their home to raise funds to buy cigarettes for our forces overseas. April 1944. The local WVS held a whist drive in Grewelthorpe to raise funds for Christmas parcels for forces. April 1944. There was a big drive to raise funds for the Salute the Soldier week. Firstly there was the usual whist drive organised by Mr W. Harrison. for the forces fund. During the interval Mr J. F. Reid introduced the Vice Chairman of the Ripon & District Salute the Soldier [S.T.S.] committee. He was Mr H. B. Revill. He addressed the gathering and he suggested that a committee was formed in Grewelthorpe to discuss raising funds for STS. The target for Ripon District was £125,000. A meeting was held later in the month and the target for the STS fund in Grewelthorpe was fixed at £1,000. It was agreed to co-operate with the school savings group and a campaign will be opened on Children’s Day by Mr & Mrs Reid. on the village green. 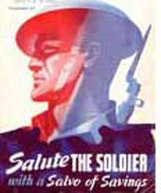 The Salute the Soldier week was to end on May 13 1944. In fact the village surpassed itself by raising the magnificent sum of over £2,000. There were Egg Collections made in various villages for the local hospitals. The Grewelthorpe collection in 1944 was organised by Mrs Dalton. 1,117 eggs were sent to Ripon & District hospital including 182 eggs from Ilton. Mrs & Miss Tennant collected and packed the Ilton eggs. Mrs Jackson & Miss Carr packed the Grewelthorpe eggs. Kirkby Malzeard, Laverton & Dallowgill collected 1,275 eggs for the Royal Bath Hospital in Harrogate. They also made £10.9s in subscriptions. Galphay & Azerley collected 276 eggs and £1.12s.6d. The matron of the Harrogate hospital wrote a letter of thanks. A public meeting was held in April 1944 in the school and it was agreed to raise funds for the return of all Grewelthorpe members of HM forces. This was to be called Forces Appreciation Fund. The Chairman of the committee was Mrs. Chapman. Collectors were chosen to make house to house collections and Mr & Mrs Harrison kindly consented to add the present Forces Fund to this new fund. A Garden fete was held in August 1945 when £60 was raised. This fund continued raising money until it was finally closed down in September 1945. In the 18 months of activity it had raised £440. 5 members of H.M. Forces who had been discharged before August 1944 each received £3. The next of kin of Private Leonard Lonsdale who died on active service, and Private T. Moore each received £7.10s. It was decided that on their next leave the 48 men & women from Grewelthorpe would each be paid £7.10s and that £50 would be kept in the bank to fund a special homecoming celebration. Report in Ripon Gazette 2nd January 1947. A welcome Home dinner and entertainment for the men & women of Grewelthorpe who served in the 1939/45 war was held in December 1946. This function was made possible by funds raised from efforts promoted by Mr & Mrs W. Harrison of Oak House, Grewelthorpe. An excellent dinner was held at the Hackfall Inn and the company included friends and representatives of various bodies in the village. 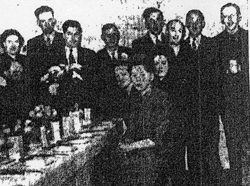 The dinner was followed by an entertainment in the school, to which members of the forces invited a friend or relative. The company enjoyed a programme presented by Joe Greaves the Yorkshire comedian and the Wallis sisters supporting artists. The vicar Rev. W. A. R. Goss in thanking those responsible for the Welcome Home, said he was glad to see so many of the men & women home again and entering into the life of the village. He also referred to those who are still serving at Home or Overseas who could not be present. Major Hinton, on behalf of the Army and for the Navy, thanked Mr & Mrs Harrison and all who had made possible the Welcome Home. Mr D.J.Leathley spoke on behalf of the Air Force. The school had been gaily decorated for the occasion. After the entertainment a dance was held and the Merrymakers Band of Dallowgill were in attendance and this brought a memorable evening to a close. In the book Dallowgill through the Ages by Lillian Chandler we learn that this band was started in 1944 when Gladys Howell. bought a small accordion and joined Stan Pickles on the piano for social evenings in Dallowgill school. Ken Spence bought drums in 1945 and they started playing for dances and social events in Dallowgill and surrounding villages. During the time of petrol rationing they had an allowance to transport the band. They charged £3.10s per evening. £1 for each band member and 10s for Mr Howell’s transport. They were still playing in 1986 with different drummers and George Baier on the saxophone. June 1944. A house to house collection made £2.16s.8d for the Soldier’s, Sailor’s, Airmen’s Families Association. The fund raising did not stop with the end of the war in May 1945. There was a Bombed Churches Fund. In November 1945 the sum of £20.13s was forwarded to this fund from Grewelthorpe and Dallowgill. A concert in Dallowgill had raised £10.16s. A gift sale organised by the Kirkby Malzeard & District branch of the Farmers Union raised £1500 for the Red Cross Agriculture Fund. In August 1945 there was a Victory Week. Grewelthorpe joined the celebrations of the victory over Japan. Thanksgiving services were held on the Thursday and the Sunday. A victory tea and sports were held on the Wednesday. Tea was served in a room kindly lent by Miss S.Scott. Mrs F. I’Anson & Mrs. H. I’Anson & Mrs Clarkson. organised the tea and afterwards there were sports held on the village green. Mr. J. E. Thorpe presented each child with 6d. A village outing was held on the Sunday. Grewelthorpe residents serving with the forces. Recorded in April 1941 in Ripon Gazette. Sgt MacDonald of Spring House, Grewelthorpe husband of Mrs. N. MacDonald. The Air Ministry posted him as missing from April 10th. They had been married only a short time. Reported July 1941. In the latest Honours List appears William Jackson Coldbeck. of 206 Squadron RAF who was awarded the DFM. Sgt Coldbeck age 20 is the son of Mr & Mrs William Coldbeck of Middlesboro. and Grandson of Robert Coldbeck of Grewelthorpe. Since the appointment of Honour he has been promoted to Flight Sgt. 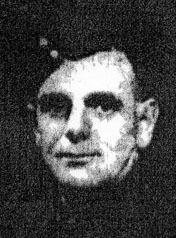 In the Ripon Gazette January 13th 1944 it was reported that 3 service men were back home on leave from service in the Middle East. 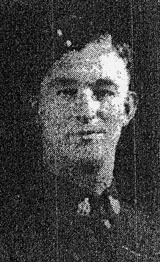 Private George Nesom. R.T.C. the son of Mr & Mrs W. Nesom. 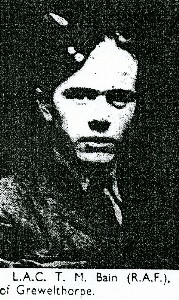 of Grewelthorpe had escaped from an Italian POW camp after being in Italian hands for 15 months. He was captured at Tobruk and taken to an Italian POW camp with 4 fellow prisoners. He escaped on September 13th 1943 and he had walked 350-400miles and was only 1.5 miles from allied lines when he was captured again by the Germans on 4th October. He escaped again on October 12th and this time reached the allied lines. It had taken him 11 days. During the last few months in captivity food problems had become more difficult as the Italian transport was bad and the Red Cross parcels weren’t getting thro’,. Private Nesom fought in Eritrea, Egypt & Libya. Driver T. Moore RASC. had been abroad 3years and had fought with the 8th Army all through the Africa Campaign & later in Italy. Driver H.Harrison R.E. had spent 2 years abroad with Persia & Iraq forces for about 1 year and with the Middle East force for about the same length of time. Reported in Ripon Gazette 6th Jan 1944. H.M. Cruiser Jamaica. Much interest has been aroused in Grewelthorpe on hearing about the cruiser Jamaica [ one of the crew L.A.Garner A.B Radar] Fired the torpedoes which finally sank the German Battleship Scharnhorst. His wife & daughter who live in Grewelthorpe are eagerly awaiting news. In WW2 there were many airfields in Yorkshire and it was inevitable that there were accidents with raw recruits learning to fly. Two such accidents are reported in detail elsewhere in the History section of this web site. Sgt. J. Nesom [RAF]. of The Ryddings, Grewelthorpe. 1944. Wedding of Sapper H.Harrison [RE] & ACWI F. Lodge [WAAF]. 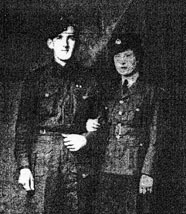 both of Grewelthorpe in 1944. Information found on the military records of Frederick Waite. Grewelthorpe. Son of John Henry Waite. He was 5ft tall. Had a scar at the base of the middle finger on his left hand. A Wesleyan. He was wounded 3 times in 1918. He was hospitalised for 14 days at Cheltenham Hospital with gun shot wounds to his thigh. He was awarded the British War medal and the Victory Medal. He enlisted in 1917 into the Middlesex Regt. Information found on the military records of Joseph Walmsley. He was the son of Major Walmsley. of Quarry House Grewelthorpe. Born in 1896 in Darley. A carter & Farm labourer. He enlisted in Feb. 1916. Described as 5ft 6inches. In April 1916 he was sent home for 3 months with shell shock. Returned to France in July 1916. In 1917 he was poisoned by gas. In 1918 he received gun shot wounds to his face and back and then again to his left leg. He was discharged. Not surprisingly he overstayed his last leave and was docked 4 days pay as punishment. He was awarded the British War Medal and the Victory Medal. 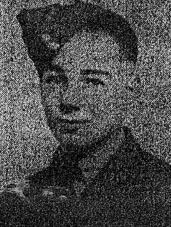 Harold Hall Joiner of Grewelthorpe was rescued from Dunkirk. His heel was shot away, as he dived into a sand dune head first. Maurice Harland has memories of war time in Grewelthorpe. Maurice was born 1930 so was a young lad during the war. During the war we would set off from school to the Hackfall woods to collect beech nuts, used as pig food, we kept a pig during the war and Billy Goundry [see Goundry genealogy] was called to dispatch it around Christmas. Mum & I used to exit whilst the deed was done. 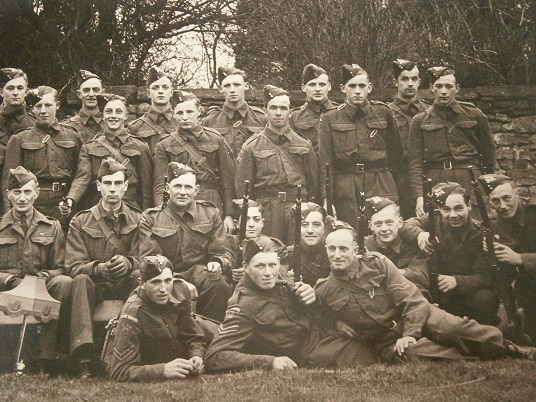 The Home Guard met during the war. 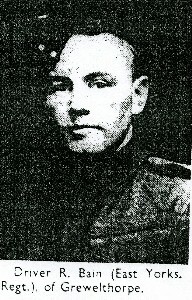 Pat Hawkin [sgt]. Billy Goundry, Roland Ashby, Les Taylor, George Harrison, Cyril Clarkson, Ken Ward, John Wood, John Neesham, Thomas Richmond. Mr Trenholme was warden. The siren warning was on the roof of Kirkby Dairy. Round from the vicarage on Kirkby Road was a search light battery, in Mr Ellis’s field. There is a barn still there on the left, where the living quarters and the cookhouse was. In the opposite field a searchlight and anti-aircraft gun was in a sandbagged area. Across from the living quarters over the field to Grewelthorpe was the generator for the searchlight and the bath house, which eventually became the school canteen where my Mum was head cook with Mrs Benson and Mrs McDonald. I don’t remember the gun being fired in anger, although many German aircraft flew over. Hence odd bombs were jettisoned around the villages as the aircraft returned to base, most serious of course was the two parachute bombs dropped on Masham. 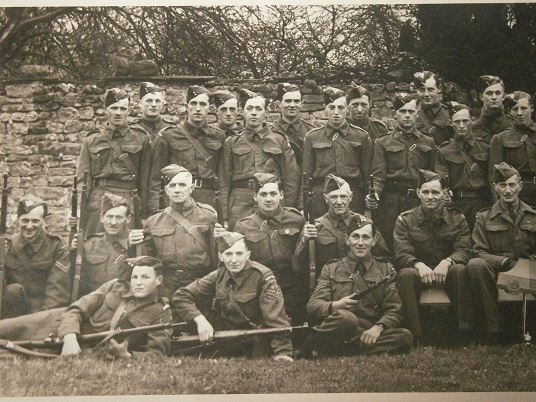 The Grewelthorpe & Kirkby Malzeard Home Guard. Middle row. ? F.Atkinson: Stubbs: J.Ward: B.Jackson: Lt. Purse: Maj. Appleby. Laid at front. W.Hawkin: A.Atkinson: C.Hawkin: H.Richardson. Back Row. D.Malthouse: T. Richmond: Howell: G.Harrison: ? Next Row. R.Ellis. K.Ward. J.Wright: P.Kitchen: D.Gill. Len Lonsdale. Middle Row. Maj. Appleby: Lt. Wood: J.Metcalfe? : Roley Ashby: Cyril Clarkson: ? A.Thirkill: J.Mason. Laid at front. R.Richardson: C.Greensit: T.Tibbetts. I can’t be 100% sure about all these names. Do you know better. Please contact me. Thanks to Dorothy Manning [nee Clarkson] for this photo. Updated May 2018. To be continued. If you have any memories of life in Grewelthorpe during either of the World Wars please get in touch.